It’s hard to believe but 2016 is here! It is time to get back on track with our nutrition, get in the gym, and make some goals. We are going to start an 8 week Nutrition challenge on January 4, 2016 and it will end February 29, 2016. That’s soon, right? Don’t worry, we are going to start easy and build over the 8 weeks. This is not only about weight loss but also about feeling better, having energy, and performing better in the gym. The cost is going to be $10. Below are some details. WEEK 1-2 (Jan. 4-Jan 17) Clean out the closet! These first 2 weeks are about cleaning out the pantry and fridge and filling it will healthy and whole foods. Getting rid of the “bad” stuff can be an adjustment so be prepared with good substitutes. Be prepared to eat lean meats, vegetables, some fruits, nuts and seeds, potatoes, whole grains, and minimal sugar. During these weeks you also need to take pictures and measurements of your body. To participate in the challenge you will need to turn in at least your measurements to Lauren. WEEKS 3-4 (Jan. 18 – 31) Dialing it in! These weeks will be all about dialing in the amounts of the foods we eat, as well as balancing them out in a ratio that fits your individual needs. You will be encouraged to weigh your food and measure it out, although it might be time consuming it is proven to work. Plus, we need to know how much food we put into our bodies. You will be given general guidelines to follow or the option to purchase specific macros for your needs from Lauren. WEEKS 5-8 (Feb. 1- 29) Stay the Course! These last 4 weeks will be all about staying on track and being as consistent as possible. This is when you will see lots of changes in your body and if you are fueling your body properly you will see performance improvements as well. Also, you will be able to receive “points” during these 4 weeks. There will be gym challenges (more info coming soon!) you can participate in to get these points. Jan. 4th – 8 week New Year CFT challenge starts. Jan. 9th (Saturday) – Information session on 8 week challenge. CrossFit Totals. Don’t miss this, it is a great baseline for the year. Measurements due. Jan. 23rd – registration for the Winter Classic closes. Feb. 1st – Gym challenges start! Feb. 25th – THE 2016 OPEN begins!! Feb. 29th – Challenge is over, updated measurements due. Prizes will be given in regards to inches lost as well as participation in the gym challenges. THIS WILL BE A GREAT JUMP START TO THE NEW YEAR. You will have the support and encouragement of our CFT community. Let’s get healthy together and learn how to fuel our bodies!! We are excited to announce that we are now carrying FITAID at the Box!! If you don’t know about FitAID yet, you will now! FitAID is the premier, paleo friendly performance and recovery product made specifically for athletes. FITAID is all natural, certified gluten free and has almost 3 grams of targeted supplements to AID your WOD. With things like Glutamine, BCAAs, Omega 3 EFAs, Glucosamine, B Complex, Vitamins C, D, E, Natural Anti-Inflammatories, Quercetin, CoQ10 and Green Tea Leaf Extract…FITAID is the most comprehensive and effective pre and post WOD supplement on the market today. On top of that, it’s lightly carbonated, sweetened with raw organic blue agave and stevia, has only 45 calories per can and tastes amazing. Be sure to try one before and after your next workout at the gym. You are sure to love them as much as we do! **Note: For an extra challenge change the reps to 30 of each. Time cap: 24 min. I am excited to announce our upcoming 21 Day Fitness Challenge! Below are some details! 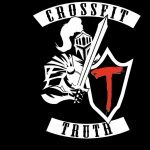 21 Day Fitness Challenge at CrossFit Truth!! 2. Vegetables – eat lots of them! · No Sugar, grains, or dairy. To win you must turn in your points sheet!! More info to come in class! Decide now you want to participate!! I hear a lot of people say they struggle when it comes to side dishes with their meals. If your household is anything like mine then at times it seems like you have the same sides over and over. It can get boring, no doubt. If you have never tried brussel sprouts or think they sound aweful, you really should try this recipe, it is delicious! It has bacon in it, what more could you want? Dice bacon and cook in a skillet until crispy. Steam the Brussels sprouts for 4 minutes, cut off the stem, and quarter. In a medium-sized mixing bowl, toss the brussels sprouts with the bacon, bacon grease, garlic powder, thyme and black pepper. Spread evenly in a glass baking dish and bake at 350 degrees for 30 minutes. Stir once half way through cooking time. © 2011 CrossFit Truth. Site customized byJake Thompson - All rights reserved.